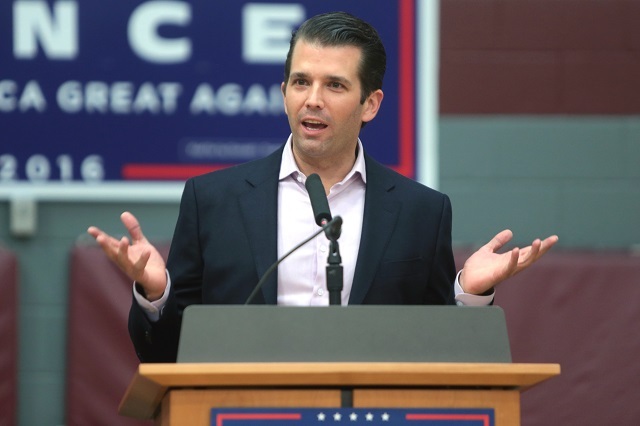 Liberal constitutional scholar Jonathan Turley laid to rest many of the claims Tuesday from the media and politicos of illegality and collusion surrounding Donald Trump Jr.’s meeting with a “Kremlin-connected” lawyer. Turley, a legal scholar at George Washington University, batted away claims of criminality, asking “does any of this constitute a clear crime or even a vague inkblot image of a crime?” His answer: no, not on the facts. Richard Painter, a former ethics lawyer in President George W. Bush’s administration, said on MSNBC Sunday that the meeting “borders on treason.” Turley notes the specificity of Article III of the Constitution’s delineation of what exactly constitutes treason — “levying war against [the United States], and “providing aid and comfort to the enemy.” Aside from the fact that the details discussed at the meeting — if any at all —regarding former Secretary of State Hillary Clinton are unknown, the encounter does not amount to treason.